One by one, novice stand-up paddle boarders ease their boards onto the chilly Deschutes River. “If you’re going to try to stand up, you want to do it here or wait until you’re further up the river,” Sue Fox shouts from the water’s edge. She’s leading a group of newbies through a two-hour introductory class. “There’s no shame in being on your knees,” she adds. Like most newcomers to the growing sport, a handful of the participants spend much of the class kneeling on their boards—or taking regular dips into the river. Still, Fox soldiers on, giving tips on form to those who manage to keep pace. A colleague hangs back with the stragglers. “I think there’s this idea that it’s the easiest thing in the world,” Fox says a month later, sipping on herbal tea during a recent chat at Dudley’s Book Shop and Cafe. She adds that it isn’t uncommon for active people to come into their first class expecting to nail it, only to find that SUPing requires skills they don’t yet have. Watching paddle boarders make their way up and down the river, it seems peaceful and not particularly strenuous. But it is the closest any mere mortal gets to walking on water. And yet, it’s a remarkably accessible sport. Fox, who has been stand-up paddle boarding for six years and teaching for three, says that most people can develop sufficient skills and confidence after a couple lessons to feel comfortable going out on their own. Mastering the sport takes more time, athleticism and dedication, but once the skills are there, a wider world of paddle boarding opens up. While SUP is taking hold in Bend, Fox says it still has a way to go toward becoming a fully developed sport. 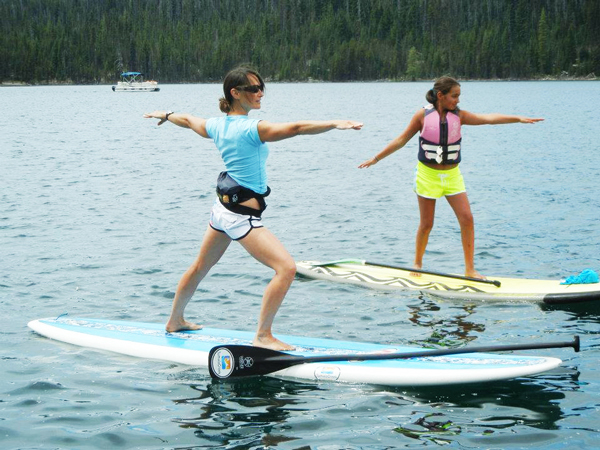 “In Bend, and on the mainland generally, SUP is a teenager in its lifecycle,” she says. People are only just starting to discover the many variations of stand-up paddle boarding, and the equipment to go with them. The most visible SUPers—the folks paddling past the Old Mill District—are typically using recreational boards. This style is the widest and most stable; suitable for a low-key trip, possibly with a kid, a dog, or a cooler balancing atop the board. But there are also racing and touring boards (a cross between recreational and racing options), as well as down under, white water and surf styles. “If there aren’t more, there will be,” Fox predicts. Between the accessibility for novices and the options for expansion for more experienced athletes, stand-up paddle boarding is experiencing a surge in popularity, especially in Bend. It’s that love of the water that brought Fox to stand-up paddle boarding and, ultimately, to Tumalo Creek Kayak and Canoe, where she currently teaches. It was there that she fell in love with stand-up paddle surfing. “It was appealing because you can see everything,” Fox says. That vantage point, not offered by long board surfing, allowed her to do things like watch whales while waiting for waves. By the time she made her way back to Oregon, she was hooked. Like most Bendites, Fox dabbles in a variety of outdoor activities, including mountain biking, downhill and cross-country skiing and hiking. But she keeps coming back to stand-up paddle boarding. Why? Her top SUP spots are in Maui and Panama, but she says Bend is her favorite place overall. Fox teaches class and leads SUP socials for Tumalo Creek Kayak and Canoe—check out their calendar for more details. Tumalo Creek hosts Pickin’ and Paddlin’, an annual series of events including equipment demos and music on the Deschutes. The events raise funds for the Bend Paddle Trail Alliance.